Here’s Felix, 7-30 to 8-5-1934. Felix is still the reluctant pet of the burglar. He tries to return every stolen item to it’s rightful owner after the crook “hooks” them. I like the 8-1, in which the little boy thinks that the grandfather clock has hatched three smaller clocks and the 8-4 demonstrating that it doesn’t pay to return a bomb to an anarchist. I love the final panel as Felix hurtles toward the sky; it’s an action-packed Messmer sketch. In the Sunday, Felix continues to elude the hungry animals on-board the abandoned ship. 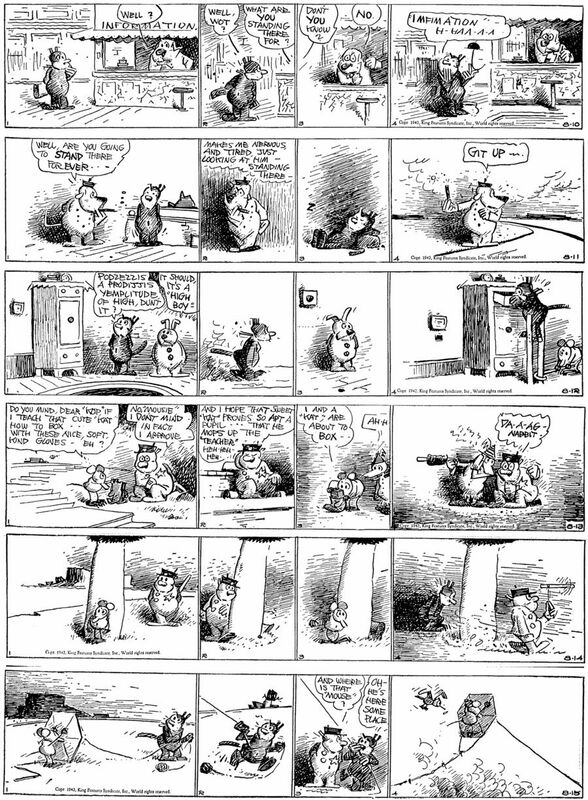 He protects himself inside an octopus’s legs in the last panel, similar to a scene in “Felix Braves the Briny” (1926). Krazy is from 8-10 to 8-15-1942 this time. There is a particularly juicy bit of “Kat Langwitch” in the 8-12 as KK asks a question about a piece of furniture called a “High-Boy”: “Podzezzis a prodijjis yemplitude of high, dun’t it?” Translation: “Possesses a prodigious amplitude of high, don’t it?” I also admire the sly sight gag that Garge uses in the 8-14 as Offissa Pupp chases Ignatz around a very thick tree and clubs him off “camera” range. Krazy’s reaction to the unseen “korpse” of the Mice is a Kat Klassic. Myrtle is from 5-3 to 5-9-1948. The storyline in the dailies is “Freddie’s Garden”, as Myrtle’s pop tries to plant his vegetables. I love the 5-7 as Myrtle and Sampson dig up everything in the garden when they are supposed to be weeding it; Myrtle: “Just pull up everything, the ones that come up again tomorrow are the weeds!” Freddie takes away the telephone receiver from Bingo in the 5-8, thinking the call is for him. In Dudley Fisher land, however, the call really IS for Bingo, and Freddie apologizes: “Excuse me, I didn’t know it was YOUR call!” The 5-9 Sunday page is beautifully composed as always. The robins are setting up housekeeping on Freddie’s ladder and Myrtle is charging one cent to look at the eggs. I love the sight gag of the giant bell tied around Hyacinth the cat’s neck to serve as a warning to the robins. 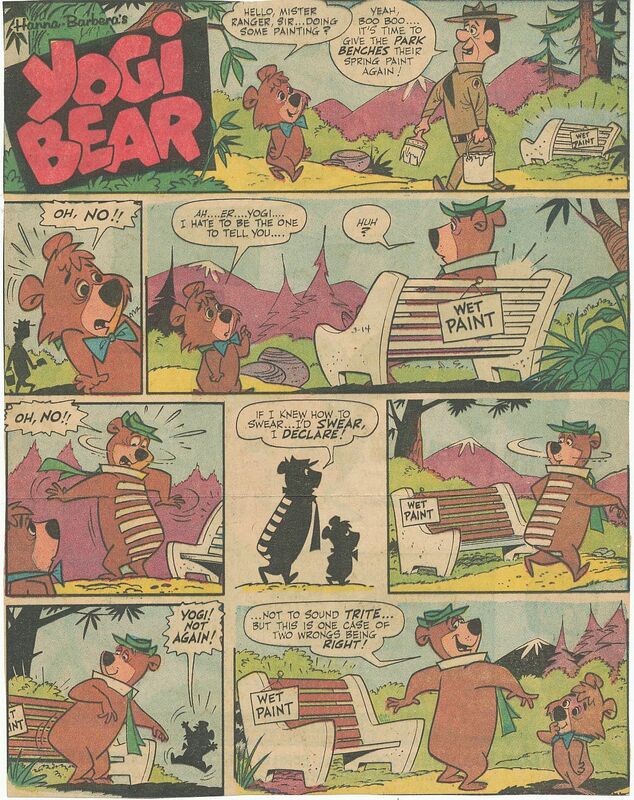 One of my favorite cartoonists, Harvey Eisenberg, is back with four more Yogi Bear Sunday pages from March, 1965. 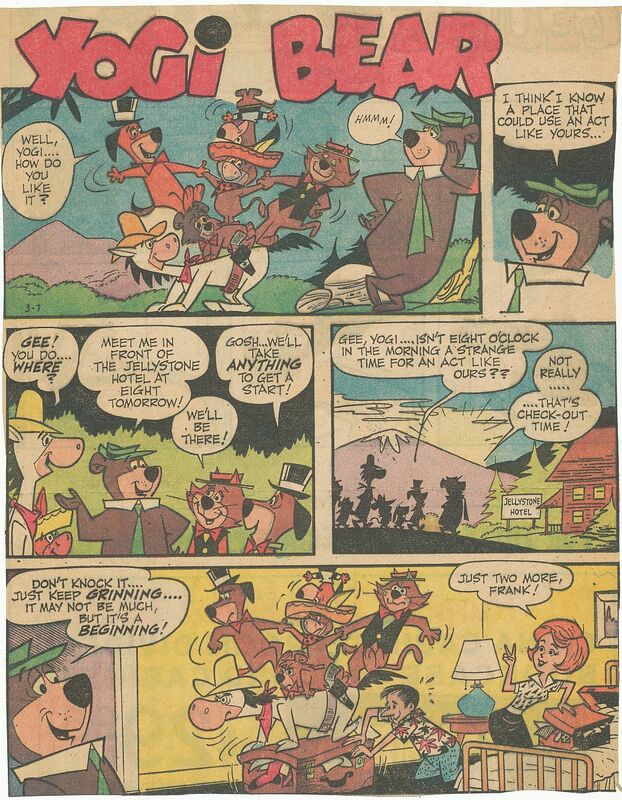 The first two are more or less “tab” format pages which incorporate the Yogi Bear logo normally missing from the third-page strips usually run here. The first one actually throws a prime-time H-B character, Top Cat into the afternoon cartoon bunch: Huck, Quick Draw, Augie Doggie, Boo-Boo and Baba Looey. The lonely little squirrel in the 3-21 is a typical cute “realistic” Eisenberg animal, along with the mother Blue Jay. In the 3-28, the hotel towels in the last panel are about 90% authentic. These pages all had great attention to comic detail, yet keep an open, friendly cartoon style. Remember to click on the thumbnails to display the images full screen. Watch for Yowp to post black and white scans of these Yogi pages soon on his blog: http://yowpyowp.blogspot.com. He will provide the missing panels and logos that the St. Louis Post-Dispatch didn’t run when I cut these out (gulp) 50 years ago. Can you tell that I wish I could have met Mr. Eisenberg while he was still around? Cathy and I attended the first Chouinard Alumni brunch on Feb. 8th out at the Cal Arts campus in Valencia. The Alumni Association provided a shuttle bus out there, so we got almost a free ride, in addition to a table groaning with omelettes, sausages, vegetables, eggs, coffee and champagne! I remarked to my friend Tim Walker who was there with Sue Crossley, that this was the first time being a member of the Chouinard Alumni Association ever paid off! Many distinguished Chouinardians were there, including my teacher, employer and friend, Bob Kurtz, and Alice Davis, great costume designer, artist, painter and widow of Disney legend, Marc Davis. Alice is hovering around 9-0, and walks quite slowly with a cane, but still remains a dynamic and appealing speaker once she gets wound up. (That’s a snapshot of her at the podium above this paragraph.) 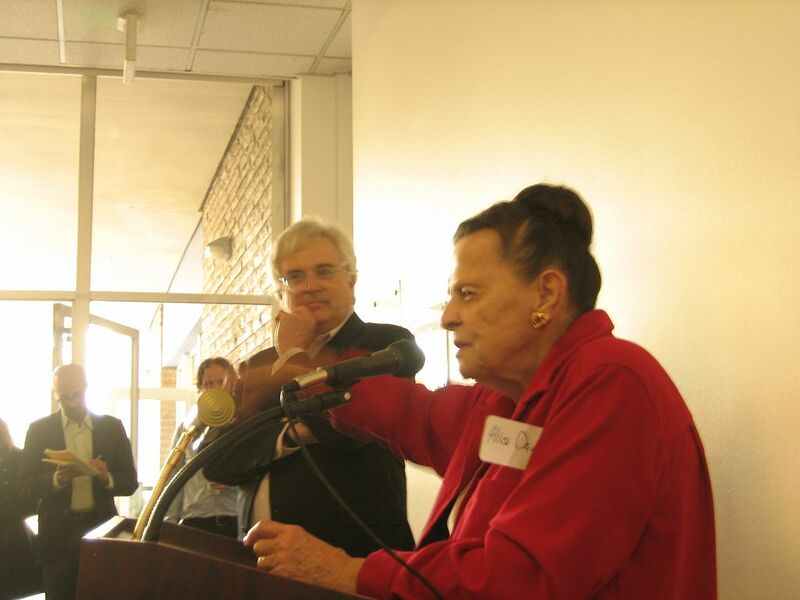 She was a friend of Nelbert Chouinard, the founder of the old Chouinard Art Institute, and told stories about her. She told us especially of Mrs. Chouinard’s philanthropy, especially when it came to giving scholarships. In fact, she gave away so many scholarships that her school was on the verge of insolvency several times since she founded it in the 1920s. At these critical junctures, Mrs. Chouinard mortgaged her house and car and kept her school afloat. (I was lucky enough to attend Chouinard in the fall of 1968 on a Bobe Cannon scholarship, which T. Hee arranged for me, and met many people there who I’ve been friends with ever since, like Tim Walker, Judith Morita, Robert Alvarez, Bob Kurtz, Gary Katona and many more.) Alice concluded her remarks by suggesting that we all emulate Mrs. Chouinard and use our great fortunes to set up scholarships for Cal Arts students! With the cost of higher education today, it takes a fortune the size of David Koch’s or Donald Trump’s to put a kid through college. I wonder if Ted Turner ever sponsors animation students, Lord knows he’s made a ton of dough out of old animated cartoons! It was a beautiful day, and a great brunch. So wonderful to hear Alice Davis talk to us! We’ll see you next time, faithful readers. You are currently browsing the Mark Kausler's CatBlog blog archives for February, 2015.